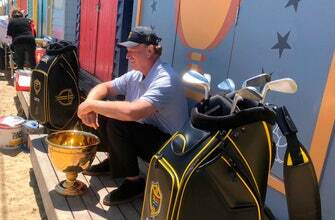 MELBOURNE, Australia (AP) — As hard as he tried, Ernie Els couldn’t put the ball in the cup. The Big Easy wasn’t on a green at Royal Melbourne, though. This was on a plastic grass strip in the middle of Brighton Beach, famous for its iconic beach houses, on Melbourne’s Port Phillip Bay. 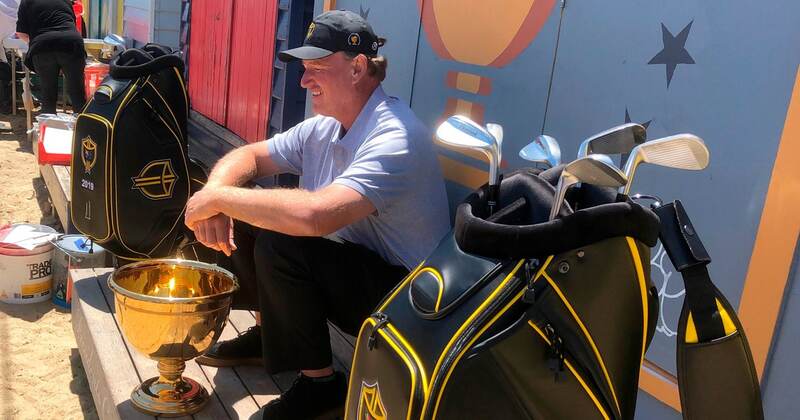 The cup was a giant plastic replica of the Presidents Cup trophy, and despite trying a dozen or more times with a wedge from about 20 meters, the closest the ball came Monday was to ricochet off part of the oversized trophy. Els is pulling out all the stops to make sure the International team, of which he is captain, hoists the real Presidents Cup next December when the tournament is held for the third time at Royal Melbourne. The International team had its only win over the United States in 1998 when it was first held at Royal Melbourne, but it has had a dry spell since — no wins and just a tie in South Africa in 2003. So Els came into Melbourne on the weekend to announce during the final round of the World Cup at Metropolitan Golf Club that Australian veteran Geoff Ogilvy would be one of his captain’s assistants for the Dec. 9-15, 2019 tournament. And to meet with the head greenskeeper and officials at Royal Melbourne to get some insights on how he might, as captain of the host team, be able to help set up the course to suit his players. Tiger Woods, the U.S. captain for the Presidents Cup next year, will make a similar trip to Melbourne in early December to check out the golf course and make some promotional appearances. On Sunday night, Els was off to host a reception at the Royal Melbourne clubhouse to unveil a new logo for the International team. The logo attempts to give the team a more unified focus while also allowing members from different countries to have the flags of their home countries represented. By Monday afternoon, he was dressed more casually in slacks and a polo shirt for his beach outing and a catered barbecue featuring lamb chops and prawns. And, of course, in the Australian beach tradition, beers from an “esky,” or portable cooler, tucked in the stand. The front of one of the beach houses, many of which are worth a half-million dollars despite the fact they are no bigger than a garden shed, was repainted to feature a Presidents Cup trophy. Members of the public walking on the popular strip couldn’t believe it when they saw Els trying his hand at cricket and passing around an Australian Rules football. Autographs were signed and pleasantries exchanged. He even played Paper, Rock, Scissors with a wacky television crew from Perth, Western Australia, who later challenged him to another attempt at putting the ball in the plastic trophy. Except one of their guys threw the ball at the cup, which was now about 50 or 60 meters away, and Els hit a gap wedge. No luck for Els this time around either. In between clubs, again.